Sometimes the holes, cracks and fissures become too large, and polishing them is much more difficult, and therefore more expensive. Therefore, the state of processing marble countertops need to get special attention, if you do not want it to fail before its term. In general, our company offers high-quality products at very fair prices. We achieve this effect by using the most modern machines and technologies. This increases productivity, and, consequently, reduces the cost of products and services. 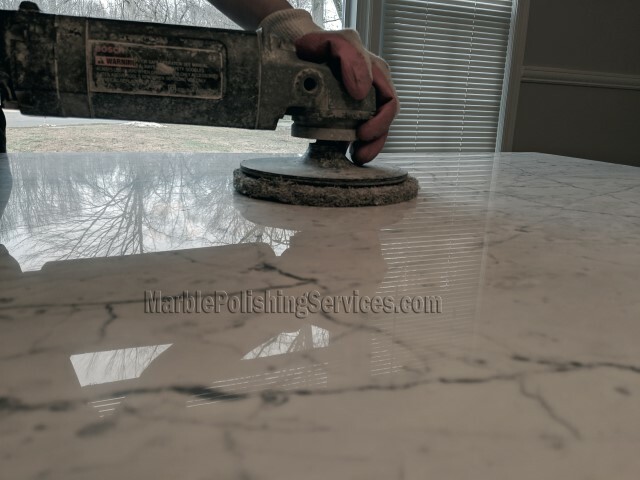 How does polishing of countertops help in everyday life? It is necessary process in order to make their surface incredibly smooth. Grinded countertops will be convenient for cooking on it, and will not require the use of various detergents in order to clean up the dirt. It is enough to wipe with a damp cloth – any blockage will be washed off after this. Our specialists own all modern technologies and equipment, which allows us to produce high-quality products. We get your countertop back to its original state or better.